The Communist Party of Canada today demanded the federal government withdraw back to work legislation and an enabling bill to speed its passage, which the government will use against the Canadian Union of Postal Workers. The union has been forced to strike as a result of the employer’s refusal to negotiate a fair contract that takes into account pay equity for women workers, health and safety, staffing, over-burdening, job security, a reduction in precarious employment, pay for all hours worked, and a better work-life balance for postal workers. By stalling, Canada Post hoped that the government would introduce back to work legislation, and undermine the union’s bargaining position. But this is bad faith bargaining by the employer, and an illegal practice in Canada. It is the employers’ bad faith bargaining that has forced postal workers onto the picket lines. It is Canada Post, and the Canadian government that are responsible for the current 5 week rotating strikes, and years of poor labour relations in the post office before that. The Tories planned to privatize the Post Office and were encouraging Canada Post CEO Deepak Chopra to take a hard line with employees in the last sets of negotiations leading to a strike in 2011. Is this the same strategy being driven by the Liberals today? The workers – and the public – have a right to know. Canada Post is a crown corporation and should set an example in collective bargaining with its employer. 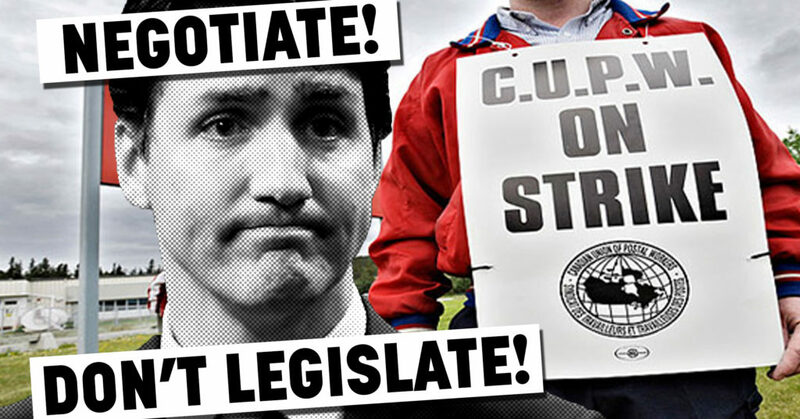 Instead, it has become the example of bad faith bargaining, backed first by the Tories, and now by the Liberals. The government claims its legislation is protecting the public interest. But in fact it’s protecting corporate profits as one of the biggest buying seasons of the year begins November 23. In this, there is no difference between the back to work legislation introduced by the Harper government in 2011 and the legislation introduced today by the Liberals. They both look after the corporations and the wealthy. In 2016, the Tories’ back to work law was found to be unconstitutional. The Liberals’ will suffer the same fate. The public will not be so forgiving however, nor will the labour movement in 2019. The Communist stands four square with striking postal workers and their union, CUPW. Withdraw back to work legislation now! Negotiate! Don’t legislate!